Do you know any five year olds? Imagine a little boy whose daily struggle to survive was so hard, he agreed to go away with a passing stranger for a chance at a new life. His name is Kam Moung and he comes from Myanmar (formerly Burma) in Southeast Asia. Despite the heart-breaking choice made by this child, his story is a happy one. He has found security and acceptance in neighbouring Thailand in a school and orphanage set up specially for ethnic Shan refugees. 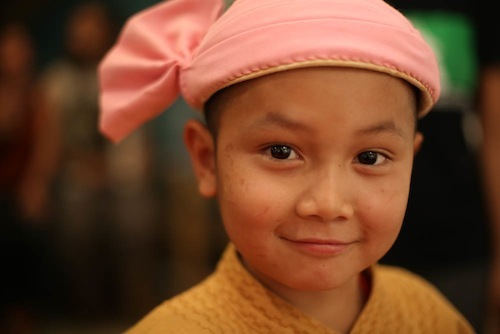 His dream is to go back some day to his mother and his village and to travel around his homeland as a big music star. In the meantime, Kam Moung is thriving in his new home. He is an excellent student and has won everyone over with his generous and bubbly personality. A colleague of mine from swissinfo.ch, Luigi Jorio, introduced me to Kam Moung in the form of a book he had written with Mathias Froidevaux about the child and the plight of Shan refugees. Luigi discovered the school in 2010 and by chance arrived on the same day as Kam Moung, the perfect starting point for a story. I was only too happy to help out with the English translation. The school and orphanage were set up by the young monk Noom Hkurh who himself fled Myanmar as a child after his village was burned to the ground. After getting an education in Thailand, he wanted to provide a caring home and safe place to study for orphans and other poor children to avoid the possibility of them being exploited or abused. Last month, Luigi was able to return to Kam Moung’s school with copies of his book. Packed with photos and illustrations, the book will serve as a unique teaching tool. These stateless children will start English lessons with material written about their own lives.